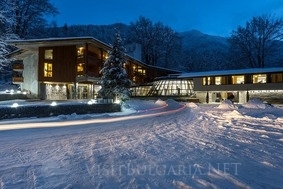 Location: Rilets Resort & SPA is a completely renovated, luxury hotel located in Rila National Park. The hotel opened its doors in 2017 and it is the only 4-star complex in this natural park. The Rila Monastery is just 200 meters from the hotel. Nearby there is an eco path crossing the Rila River, which passes near the hotel. Accommodation: The hotel offers 76 rooms and suites, stylishly and comfortably furnished to make guests feel at home. The rooms have beautiful mountain views. - Massage rooms, sauna, steam bath, salt bath, hamam, solarium, relaxation area, hairdresser, manicure / pedicure, fitness center. Conference center: The hotel features 2 conference rooms and a VIP room. The capacity is up to 280 people. - A babysitter on call, a doctor on call.